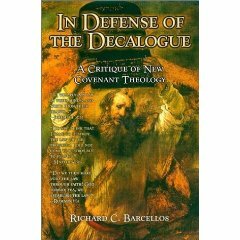 I have attempted to make some general observations, as well as offer some commentary on Barcellos’ critique of New Covenant Theology entitled In Defense of the Decalogue. In continuing our review/summary, the Introduction offers some general characteristic of NCT. Contextually, NCT is a “movement within conservative, Evangelical, and Calvinistic Baptist circles (11).” With the rise of Calvinistic thought in the SBC, it is probable that NCT might become a haven for SBC refugees. D.A. Carson and many others find NCT intriguing, if not compelling. NCT avoids traditional CT emphasis on continuity and Dispensational emphasis on discontinuity. Focusing on passages like Jeremiah 31:31-34, NCT advocates conclude that in the New Covenant there is a new law, “which is higher and more spiritual than the Law of Moses” (11). This seems to be a perplexing conclusion. Is the main difference between the Old and New Testaments that the New is more spiritual than the Old, thus making the OT insignificant when it speaks of ethics? NCT speaks of the new law as the Law of Christ ( following I Cor. 9:21 and Galatians 6:2). Thus, the Law of Christ of Christ replaces the Mosaic Law. Jesus incorporates selective passages from the law of Moses, but not its whole. In my mind, not even the strictest theonomist would have a problem with this statement. Bahnsen, for instance, spends a considerable amount of time in his Theonomy in Christian Ethics detailing the discontinuities between the law of Moses and the law in the New Covenant. For Bahnsen, if the New Testament does not rescind an Old Testament law, then the Mosaic Law continues in the New Covenant. NCT advocates would dispute this claim by stating that Jeremiah 31 abrogates the OT law with a new law that indeed (and this is important) incorporates some Mosaic laws, but dispenses or abrogates others. Still, theonomists or other CT advocates see no problem with the abrogation of some of the Mosaic Laws, in particular what CT theologians call Ceremonial Laws (see Ken Gentry’s Covenantal Theonomy). NCT interpreters see Matthew 5:17-20 as a crucial passage in understanding what occurs in the ethics of the New Covenant. They argue that the OT law “undergoes a redemptive-historical shift in application (12).” Again, Amen! Bahnsen, Jordan, and many others would echo this view. Klineism would welcome it with greater intensity than most Covenant theologians. In fact, I wonder how much commonality there is between the NCT and Klinean CT (sacraments aside, there is lots of similarities in their view of ethics). Finally, Barcellos concludes with words of praise for the NCT effort to pursue a rigorous exegetically-driven theology, but yet his concerns remain. The following chapters will seek to offer a response to NCT, while defending the “perpetuity of the Decalogue” (13). Editor’s Note: Thanks to Greg Gibson for some helpful insights and quotes. First, NCT is not monolithic. Advocates of this position have different nuances. Second, it is a relatively new school of thought, hence there is no definitive work on NCT. Third, Barcellos mentions that a major proponent of NCT has altered his view of the Old Covenant. Whether he succeeds in proving his theses and offering a response to NCT, we shall see. Commentary: Covenant theologians also differ immensely with one another. Even the Westminster Confession of Faith was written as a consensus document. There were debates over the idea of a “Covenant of Works,” “active and passive obedience,” etc. Every system will inevitably–in light of continual research–lead to questioning certain details. Even if a document such as the WCF is produced with a clearly laid-out view on all systematic issues, there will still be those who will take exception to it (the Sabbath as a major exception in virtually every PCA examination). Confessions are not Scriptures, so they must be continually examined in light of Scriptures. The addition of NCT is a helpful attempt to examine the role of the Mosaic Law in the New Covenant. I welcome this attempt to distance itself from Dispensationalism with its fundamentally flawed separation of Israel and Church. As a Covenant Theology advocate I too find places in which traditional CT expressions need to be improved upon. For instance, the idea of a “Covenant of Works” seems largely foreign to a grace-saturated revelation. This over emphasis in a works-based Edenic administration has led to the abomination of Klinean covenantalism. New systems need to be welcomed and examined. Barcellos has done the extraordinary task of examining the claims of NCT and offering a response. In the next post, I will focus on the Introduction to the book. Editor’s Note: Someone has been gracious enough to let me know about a response to Marcellos’ book by John Reisinger entitled In Defense of Jesus, the New Lawgiver.The reader can purchase both books, but I will focus exclusively on Barcellos’ in these reviews. a) These scholars are committed to the London Baptist Confession and Westminster Confession of Faith. This implies a certain confessional presupposition. b) These writers have a high view of Scriptures. George Knight, for instance, delivered a lecture at Greenville Seminary many years ago about the necessity of Scriptures to all of life. The other endorsers will happily agree. c) These writers all share a common distaste for Dispensationalism. Kenneth Talbot writes: “…this new teaching (NCT) is nothing more than implicit dispensationalism.” Further, he says that Barcellos’ book “has brilliantly identified the unbiblical errors upon which this man-made doctrine has been established.” In their estimation, NCT is simply a resurrection of another error. d) The debate centers around exegetical concerns. All writers affirm that Barcellos is capable of critiquing NCT exegesis. 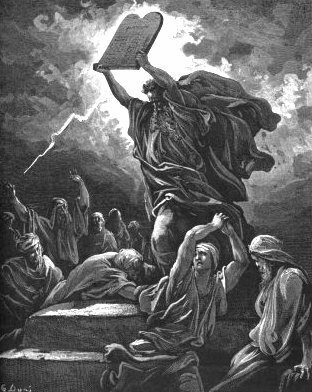 e) All endorsers of this book believe strongly in the continuing validity of the Ten Commandments in the New Testament age. a) High view of biblical authority. c) Belief in the Continual Validity of the Ten Words to the modern day, which includes a high view of the sabbath (4th commandment). NCT advocates will certainly concur with the first, but take exception with the second and third. In the next post, I will focus on the preface to the book. I have begun reading Richard Barcellos’ In Defense of the Decalogue. The book is a critique of New Covenant Theology. I first came across New Covenant Theology (NCT) in my third year of college. In those days I was transitioning from Dispensationalism. I was uncertain about what was next. Paedobaptism seemed an odd leap, and I was not prepared to accept Moses into my heart. Hence, NCT came to me in the on-line articles of Fred Zaspel and others. NCT offered the proper balance and a perfect spot to rest. It avoided the rapture craze of Dispensationalism, while avoiding the unfortunate conclusions that Covenant Theology offered. It all seemed so reasonable: no Sabbath, no Paedobaptism, and plenty of Jesus. Suffice to say, six months later I decided to abandon the parking lot and move into a Covenant Theology home. I have remained there for the last seven years. Although CT has its nuances, and is far from a monolithic position, it offers the safest and purest picture of God’s redemptive work. In these next few posts, I would like to review Barcellos’ book and consequently, offer some thoughts.